While some parents are reluctant to consider allowing their child “time off” after graduating from high school, there are many university deans and presidents who would encourage it. 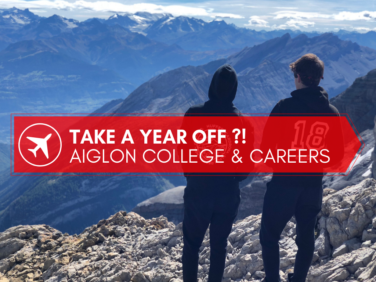 At the conclusion of Aiglon’s International Baccalaureate diploma programme, students are naturally tired; the academic rigour, alpine challenges, and normal adolescent pressures can be exhausting and stressful. Before engaging in one’s undergraduate studies, sometimes a break is needed. This break is not a time to sit around, but rather a time to follow a structured and planned journey to discover more about the world, people, languages, cultures, and one’s own interests, strengths, talents, and aspirations. In all cases, a gap year produces a more focused and aware young adult. Read other university deans and administrators’ quotes here. There are so many options to consider when planning a gap year. The following chart, a part of the 2015 National Alumni Survey which was undertaken by Nina Hoe, PhD, in collaboration with the Institute for Survey Research, Temple University, and the GYA Research Committee, details the most significant influences when deciding to take a gap year. Whether travelling, working, interning, training for a sport, enrolling in academic courses or fulfilling a required military post, a year between high school and university can be a combination of any of these things! Explore possibilities through the network of family, friends and Aiglon alumni! Will my child ever return? The fear that students will lose interest in learning and not wish to return to university is not supported by the research and data gathered about gap year participants. The US-based data indicates that 90% of students return to university studies after their gap year experience. An active and structured year designed to meet one’s personal needs, interests, or talents only enhances and motivates a student towards their desired university course or major. Open the mind, then open the door! Plan the logistics of the gap year; weeks or months on which project? Travel and lodging logistics?